Set for Europe, could Indian maker also target U.S.? The Tata Pixel reportedly gets the go for Europe. But will the Indian maker next target the U.S.? Even by city car standards, Tata’s Pixel concept is diminutive, measuring just 10 feet nose-to-tail, or nearly a foot smaller than the Indian maker’s already compact Nano. But there’s apparently a market to be had, Tata reportedly giving Pixel the green light for launch into the European market. Could the States be far behind? Tata took the wraps off the little Pixel at the recent Geneva Motor Show, and the white, gull-winged two-door proved one of the most popular concepts of the show – if for no other reason than curiosity value. Tata bills Pixel as “the most package-efficient four-seater in the world,” and it is, indeed, a surprisingly roomy vehicle, one that could readily hold four adults – as long as those in the back weren’t part of an NBA team. In European trim, anticipate a weight of less than 1700 pounds. It will help that Tata expects to remove the gull-wing doors, which require plenty of reinforcement, and replace them with conventional portals. Even with the front seats in a normal position, the Tata Pixel offers surprising interior space. Would that mean introducing Pixel into the U.S.? For now, the maker is mum. It has taken a long view on accessing the States, hoping to avoid the embarrassing setback suffered by Indian rival Mahindra & Mahindra, which has apparently postponed indefinitely its American market debut. The challenge for Tata will be to meet strict American emissions and crash regulations, the latter likely to result in the addition of hefty bumpers, at the very least. In turn, that would add weight requiring an upgrading of the engine. And that’s if Tata even wanted to stick with a diesel, something that hasn’t connected well with American motorists. But could there be a market for something so small in the U.S.? Company insiders admit it’s a concern, especially in light of the fading fortunes of the Smart fortwo. On the other hand, Smart has suffered from the lack of a truly competitive product. It’s unclear whether the Tata Pixel could be a more appealing alternative – but Tata is clearly keeping an eye on its opportunities on the western side of the Atlantic. 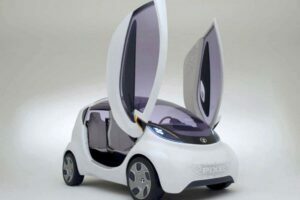 This entry was posted on Wednesday, March 16th, 2011 at and is filed under Automobiles. You can follow any responses to this entry through the RSS 2.0 feed. Both comments and pings are currently closed.